In November 2010 there will be released a fiftieth anniversary reissue of Christopher Tolkien's masterly translation of the Icelandic Heidrek's Saga, including the dramatic Battle of the Goths and the Huns, the lyrical Waking of Angantyr, and the unique riddle-contest between King Heidrek and the god Odin. Christopher Tolkien originally published Saga of King Heidrek the Wise: Translated from the Icelandic with Introduction, Notes and Appendices in 1960 (1). The reputed Viking Society for Northern Research have made available online virtually all their publications (2). In there publication library you will find texts of the Elder or Poetic Edda and the Prose Edda, the translation by R.G. Finch of the Völsunga Saga, as well as many other texts of great interest, published by some of the foremost specialists in the domain. There collection also includes Christopher Tolkien's edition of "The Saga of King Heidrek the Wise", as published in 1960 (3). This book is of interest to J.R.R. Tolkien readers as it shows some of the Norse influences on Tolkien's Middle-earth and the characters he uses in his mythology. You can find references to the Sword "Tyrfing", a parallel to Turin Turambar's sword "Anglachel", which is cursed and will not be sheathed until it sheds blood. "Brego" is Icelandic for "Lord" and is the name of the Second King of the Rohan. "Durin" is used by Tolkien as "Durin the Deathless" one of the Father's of the Dwarves. "Dwalin" is a variation of "Dvalin" and "Mirkwood" is a variation of "Myrkvior" (4). In the Annotated Hobbit we can read that Douglas Anderson sees Gollum's fish riddle as a slight analogue to [a] riddle [that appears] in the Old Norse Saga of King Heidrek the Wise (pp. 125-26) (6). John Rateliff in The History of the Hobbit (pp. 168-174) also sees The Saga of King Heidrek the Wise as one of the most important inspirations for the riddle game in The Hobbit (7). Of course this publication can be closely linked to the latest publication by Christopher Tolkien, The legend of Sigurd and Gudrun, where he edited Tolkien's extensive retelling in English narrative verse of the epic Norse tales of Sigurd the Völsung and the Fall of the Niflungs. Heidrek's Saga is a medieval entertainment - a 'romance', but a romance that derives little of its matter from the literature of France or Germany. 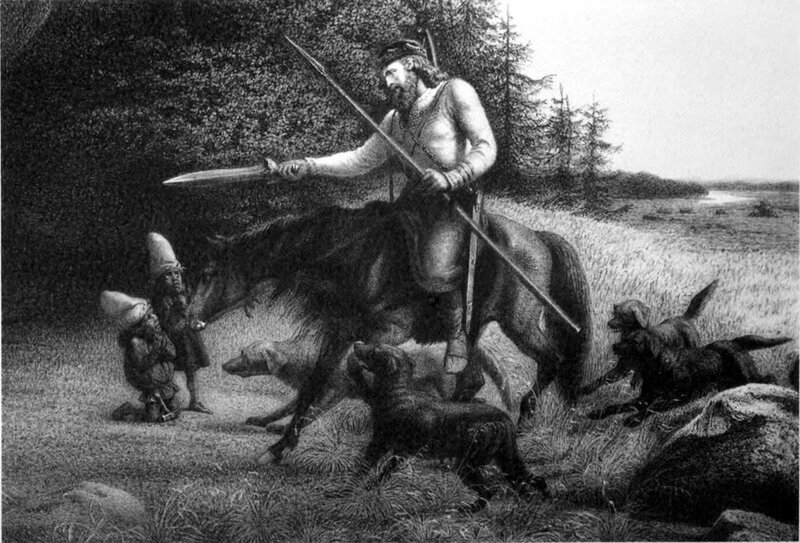 It is an example of a kind of story-telling that was flourishing in Iceland by the beginning of the twelfth century, and which (in contrast to the more celebrated 'Sagas of the Icelanders') told of legendary figures whose origins lie far back in time beyond the settlement of the country. The elements of the story, diverse in age and atmosphere, are unified in the theme of a possession bearing an ancestral curse, as it passes down the generations; but the saga's peculiar value lies in the older poems which the unknown author set into the framework of his narrative, including The Battle of the Goths and the Huns, perhaps the oldest of all the Northern heroic lays, The Waking of Angantyr, source of many eighteenth-century 'Gothic Odes', and the unique riddle-contest between King Heidrek and the god Odin in disguise. Translated from the Icelandic with Introduction, Notes and Appendices by Christopher Tolkien, then Lecturer in Old English at New College, Oxford, The Saga of King Heidrek the Wise was first published in 1960 in Nelson's Icelandic Texts series and has since become extremely difficult to obtain. Marking its fiftieth anniversary of publication, this new hardback edition reproduces the original text so that new academics and devotees may once again study and enjoy the prose and the poetry of this famous saga from the same tradition as The Legend of Sigurd and Gudrun, which under Christopher Tolkien's editorship became a worthy best-seller in 2009. This edition will be available exclusively as a print-on-demand hardback from www.tolkien.co.uk, still it is already listed on amazon, so maybe it will be open for order there as well. The Amazon listing mentions 208 pages, which is rather strange, since my own 1960 copy only has about 100 pages; so maybe this edition reprints the translation next to the icelandic text? Or can we expect it to be illustrated? Or did Amazon make a mistake. I suspect we just wait and see! 1. Tolkien, Christopher (1960) The Saga of King Heidrek the Wise: Translated from the Icelandic with Introduction, Notes and Appendices. Thomas Nelson and Sons Ltd.
5. King Svafrlame Secures the Sword Tyrfing. Published in 1906. Rydberg, Viktor. 1906. Teutonic Mythology Vol. III. Facing page 1003. 6. Anderson, Douglas A. (1988) The Annotated Hobbit. George Allen and Unwin. 7. Rateliff, John D. (2007) The History of the Hobbit. HarperCollins.